There are more than a million Aboriginal people in Canada. The Aboriginal population is growing faster and is younger than the non-Aboriginal population (the Aboriginal birth rate is fifty per cent higher). Aboriginal communities are united in the belief that education is critical for their social culture and economic development and prosperity but there are huge gaps in educational achievement between Aboriginal and non-Aboriginal students, measured by early literacy, high school graduation rates and university enrollment. The costs of under achievement are enormous for individuals, ﻿communities and for Canada. Real change comes about at the classroom and school levels. There are examples in Canada and other countries of schools where Aboriginal children are educated in more than one language, graduate in high numbers and go on to third level education. Closing the educational achievement gap for Aboriginal Canadians relies on teachers and education leaders, Aboriginal and non Aboriginal alike, in all schools and educational organizations across the country having the tools to make that change happen. Ensuring that all educators have those tools is the goal of the Faculty of Educations Teaching and Learning Circle, a partnership between the Faculty and Aboriginal communities. Our vision is that ten years from now, half of the educators who are making a difference in Aboriginal education in Canada will have been a part of our Teaching and Learning Circle. Our focus then is on the people at the head of the classroom and that focus is unique. How do we accomplish that goal? 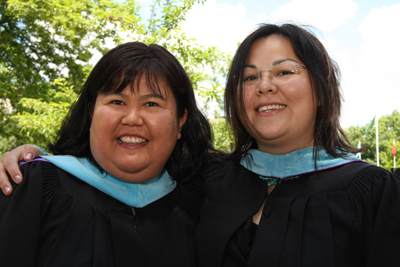 First, every graduate from the Faculty's programs will be educated about Aboriginal issues. Through course work, placements and internships, in schools and educational organizations serving Aboriginal children and young people, all of our graduates will develop an understanding of Aboriginal culture, language and issues in education and take that understanding to teaching and leadership positions in schools across the country. No other Faculty of Education in Canada has made that commitment. Second, through summer institutes, workshops and seminars (on site and virtually) we will reach practicing teachers and education leaders all over Canada. We will establish a network of the visionary educators, educational leaders, researchers, elders, students, and others. We will leverage our partnerships with educators and academics in Indigenous education and with Aboriginal communities in Canada and other countries (e.g., Finland, Norway, Brazil, USA) and capitalize on technology to broaden the Network. It will serve as a gathering place where complex issues can be addressed, where success stories and resources can be brought together, where student and teacher exchanges can be arranged and where teaching and sharing with students, educators and education leaders in local and distant communities can take place. The Teaching and Learning Circle will be accessible to everyone who wants access. It will connect the dots, and will be recognized internationally as a one stop shop for accessing expertise, promising practices and resources for Aboriginal education.